There have been times in my life that I have had a negative mind. A negative mind often gave me negative results. When I talk to young people, with negative thoughts, I have to immediately say STOP! Negatively will prevent us from taking chances. Many times negativity will come from comparing our appearance to others. Or perhaps, we think we are inferior for other reasons. What I have found is that positive thoughts often bring positive results. “Attitude is a rare example of something that’s always 100 percent within your control.“ Change your attitude! I choose to focus on being healthy, having faith and knowing that I am going to meet my goal. H.O.P.E. WITH YOU ON YOUR JOURNEY!!! *JACKIEWALKS4FUN posted a great little sentence and I just had to share...."Seven days of no exercise makes one weak." I hope you have set your July goals and are ready to rock this month! This is SO inspiring! I've always said that 'thoughts are things' and what we focus on is what we attract to ourselves. Thank you for this beautiful reminder! Like your "attitude" quote. I totally agree. That glass is half FULL. You can train your mind to respond positively to negativity, regardless of the source (internal / external). Emotions will follow. It eventually becomes a habit which will then take less effort to flip sides. Yes, I have a negative mind sometimes, and it seems more so lately in the past two years. I was an optimist as a child and young adult. I have to remember how I felt then, and look for signs of hope sometimes! Thanks for the reminder. ( Sorry I missed your blog yesterday). May we miraculously find freedom from negative intrusive thoughts. My thoughts can be tiring, especially with abundant emo baggage, so, for me, to keep watch over myself, I have to CHANGE my thinking with daily monitoring. I'm responsible for what I think, so I fortify myself by reading inspirational words or hanging out with positive people. By detaching myself from dark toxic memories and/or people known to influence thoughts that provoke pain by stripping the joy out of me, I apply an ongoing healing salve. It's a process of...as Peter Pan said, "thinking *happy* thoughts." When we were in Search & Rescue we were taught that the first rule for survival is PMA - Positive Mental Attitude. This is a very true blog, thank you! LOVE this!! maintaining a positive attitude makes such a difference! Great blog! It's great that you are helping young people think more positively! I agree so much with this. I try to be positive everyday because there is good in everyday. Thanks for the reminder. I try hard to remain positive. I learned a long time ago negativity feeds more negativity. It's makes a much more pleasant life if one tries to remain positive. Your post reminds me of this Henry Ford quote, "Whether you think you can or think you can't you're right." Yes, anxiety is an inborn personality trait, so it's not easy to change my attitude genuinely. I spent most of my career acting "positive." It was draining emotionally to keep up that front. I'm happy to be free of it! 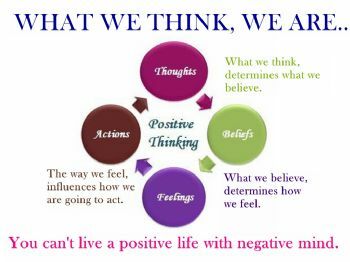 You are so right about a negative mindset - it can be a difficult habit to break, but SO worth it! So True - when i finally stopped being so hard on myself when i mess up I finally started feeling better about myself! Thanks for your blog! Love your last sentence! That's how I feel.